“When it comes to location scouting, some say Machado has a crystal ball for establishing the next hot spot — on Southeast Division, in the Lloyd District and in Nel Centro’s part of downtown before they all saw their Renaissance. 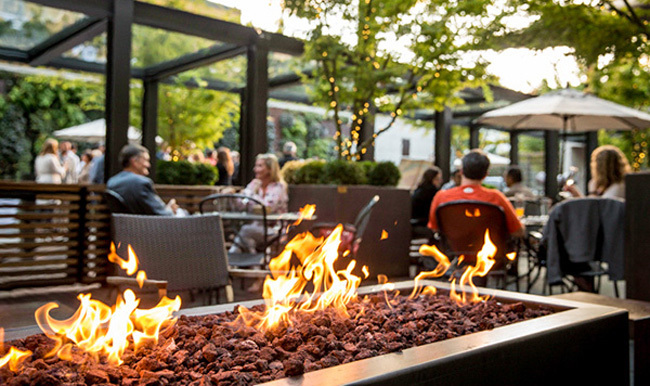 The inviting patios at downtown’s Nel Centro (above) and Lloyd District’s Altabira City Tavern have been part of the success formula for owner David Machado. It’s patio season for restaurants, and Altabira City Tavern boasts one of the city’s best. Smack dab in the middle of the busy Lloyd District with views of the city skyline from six stories up, the covered space outside the main restaurant at the Hotel Eastlund — with heaters, sofas and a swanky urban vibe — has grown into a hotspot for Rose Quarter crowds, business people and happy hour groupies alike. But David Machado never expected the patio to be a “scene,” as he puts it. As owner of Altabira — which marks its first birthday this month — he built the patio simply as an extension of the dining room, which serves 16 local beers on tap and a beer-forward, locally sourced, seasonal menu. In other words, the crowds came out — en masse — for Portland’s newest patio, as we are prone to do. And it got rowdy. But then it calmed down. It’s going to be nice weather for awhile, meaning David Machado, owner of Nel Centro and Altabira, will be hosting patrons on patios. And now as it heats up again, Machado is bracing for patio season at Altabira and his other restaurant, Nel Centro, located downtown at the Hotel Modera. Both are large restaurants, close to 300 seats apiece, serving a specific niche of tourists and locals alike, which Machado is keenly aware of. At Nel Centro — which just celebrated its seventh birthday — the patio is warm, inviting and feels like someone’s backyard party. A major part of the demographic are arts patrons coming downtown for a show; in fact they often run cocktails based on an opera or ballet title, like a “Magic Flute” procecco and “Sweeney Todd” bourbon drink. With a relaxed vibe and wine-forward, Euro-centric menu, it turns into a different beast in the summertime when everyone’s hankering for that perfect happy hour experience. In fact Nel Centro first opened without a happy hour, but started one six months later due customer demands. With deep roots in Portland’s restaurant world, Machado has seen what works, and what doesn’t. In addition to Altabira and Nel Centro, he owns Citizen Baker, the street-level bakery and cafe next to the Hotel Eastlund that also turns one this month. But this isn’t his first rodeo. 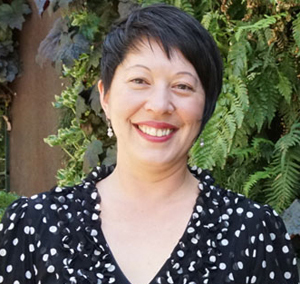 With roots in San Francisco’s food community in the 1980s, Machado moved to Portland in the early 1990s and opened several beloved restaurants that have since closed, including Pazzo Ristorante, Lauro Kitchen, Vindahlo, and recently The Heathman Restaurant. He also opened Southpark Seafood Grill, which just reopened after a major renovation. In 2009, he was the Oregon Restaurant Association’s Restaurateur of the Year, and he’s been a past board member of the Portland Farmers Market, International Pinot Noir Celebration, Share Our Strength, Travel Portland and the Portland Jazz Festival, as well as being active in numerous other organizations. As he looks toward retirement, he has a lot of dreams. Also, he’s a heavy traveler, visiting Europe every six months with different friends and family members, including Julie, his wife and restaurant partner of 31 years. So what does it take to run a successful restaurant in Portland? When it comes to location scouting, some say Machado has a crystal ball for establishing the next hot spot — on Southeast Division, in the Lloyd District and in Nel Centro’s part of downtown before they all saw their Renaissance. He’s constantly reflecting on the past and looking ahead. As Baby Boomers age, Millennials globetrot and social media levels the playing field about food knowledge, Machado has seen the rise of food trucks, local artisans, pop-up dinners and what he calls the “rebel restaurants,” with their farm-dug beets and half-hogs broken down in the kitchen that morning. As he looks to the future, Machado hopes that Portland’s gentrifying inner city doesn’t lead to such a rent increase that young chef/owners are priced out. The low barrier to entry “has made us a great food city over the last 20 years,” he says. Now that new hotels, restaurants and businesses will soon pop up all around Altabira in the Lloyd District, Machado couldn’t be happier. But he’s not resting on his laurels. Read the article on the Portland Tribune. It is our pleasure to announce the recent promotion of Michelle Glass to Nel Centro General Manager. 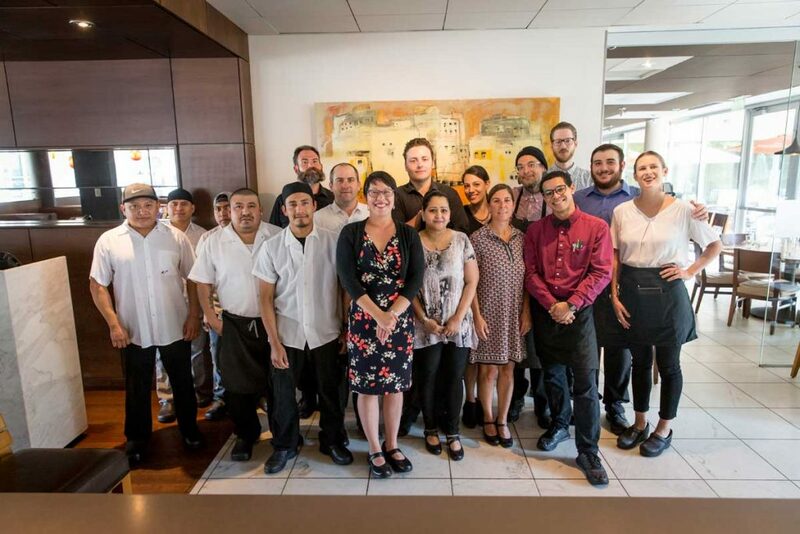 Michelle has been the Assistant GM at Nel Centro since its start in 2009 and we are so very proud to continue our wonderful relationship with her. We asked Michelle to share with our readers a little about her story and how she has enjoyed so much success after relocating to Portland. Michelle: In August of 2008, my husband and I visited Portland on vacation, fell in love with it and started making plans to relocate from our home in Ashland. We were looking to move up to the city and be around a more diverse food scene with more cultural opportunities for our daughter and more of a bike scene for my husband, Steve who is in the bike business. I was introduced to (Nel Centro owner) David Machado through a mutual acquaintance from another downtown restaurant. Dave was just starting to put [Nel Centro] together so everything kind of happened all at the right time. By the next April I had moved up here. What’s the biggest change you’ve seen over the last 6 years? Michelle: I think what’s had the biggest impact on our business is understanding where our guests are coming from. Recognizing that we serve a diverse group of people: the business community, performing arts patrons, hotel guests, PSU etc. and that all those groups use the restaurant differently. Also, recognizing our patrons and how they use Nel Centro has really allowed us to tune into menu items, staffing hours — all of that stuff. 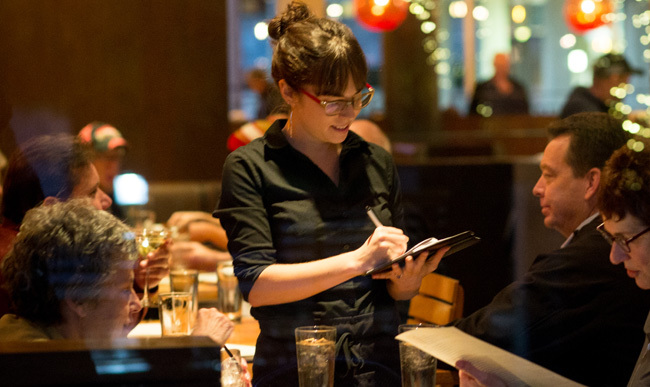 Michelle: I like our staff because everyone is really dedicated to hospitality. They’re a joy to work with. I also love our regulars. I see many many people that I adore who visit us on a regular basis, several times a week, and they feel like family to me now. Being able to be at work and have such a wide range of friends, customers, and wonderful employees — it’s really satisfying to the soul to enjoy so much of that. Michelle: What’s not to like?!? I love Italian food and the diversity of recipes. I like exploring different types of food since there’s always something new to learn. I also really love the alchemy of food and wine together. That’s what really got me passionate about the restaurant business – how that can be an art form essentially. When you have a server who can recommend the right wine with the right dish it elevates both of these experiences. I feel like that’s what a great restaurant experience with what a great server does — helps you find those magical pairings that make everything better. What’s your earliest memory of food or cooking? Michelle: My earliest memory is probably my grandma making breakfast for me in the morning before school. Eggs, Canadian Bacon, Toast. Really simple but really satisfying. What are you passionate about, other than your job and family? Michelle: The city of Portland and all the amazing beauty plus the incredible food & bike culture happening here. What’s your favorite Nel Centro menu item? Michelle: Right now I’m addicted to chef John’s Spaghetti with the Dungeness Crab. That dish is very simple but all the components work together so well that if you leave one of them off the dish isn’t the same. Those Bottarga breadcrumbs just take the dish to a whole new level. Michelle: A Negroni, I tend to like bitter, intense flavors so anything along those flavor profiles I really enjoy. What one word describes Nel Centro to you? 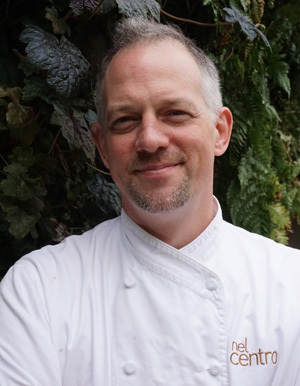 Nel Centro is proud to announce that John Eisenhart is our new executive chef. 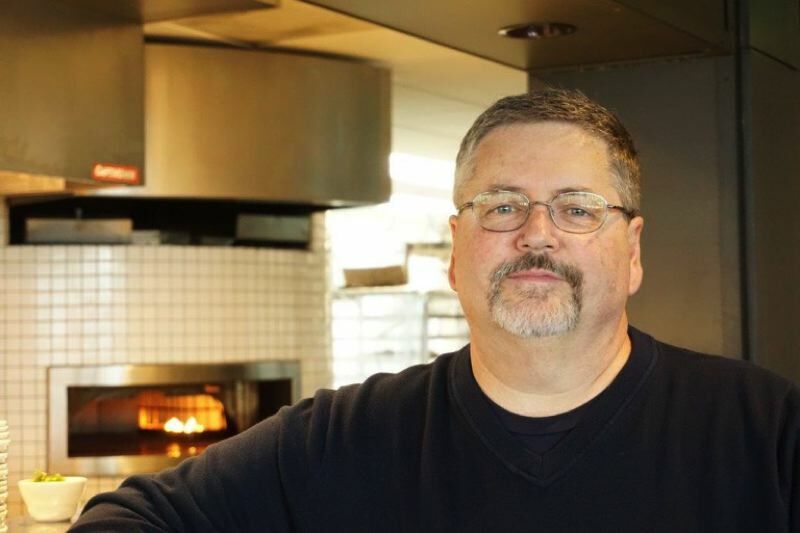 John has been an integral part of the Portland food scene over the last 11 years while directing the kitchen at Pazzo Ristorante as their executive chef. We are very excited to have chef Eisenhart join us and share his passion and expertise for Italian and French cooking. We are quite sure that this is the just the beginning of a beautiful relationship. Why a career as a chef? My first job was cooking at my mom’s deli in Sonoma, California. I did have plans to become a graphic designer and attended art school but when money ran out for school, cooking was the career path that I returned to. Do you cook in your spare time? Yes, I cook a range of cuisines but I am particularly interested in Asian cuisine at the moment. I am inspired by raw ingredients that are seasonal. I also enjoy the challenge of creating dishes when ingredients are limited. I feel that I can sometimes do my best work when options, ingredients and time are limited. That would have to be deep sea fishing and eating the fresh catch. I enjoyed a memorable meal like this in the Bahamas 15 years ago. Your earliest memory of food or cooking? My mom was a 1970’s hippie and loved to grow shiitake mushrooms, can produce from the garden and make homemade yogurt. My earliest food memories are from being involved in these DIY culinary projects. Best part of your profession? I love the teaching and mentorship that comes with being in charge of a kitchen staff. I also love seeing our work come together – dishes, menus and service. When things comes together just right, it gives me a great sense of satisfaction. Favorite ingredients to work with? I especially enjoy working with foraged ingredients — I spend time in the woods with my dog hunting for mushrooms and things like wood sorrel. What are you looking forward to at Nel Centro? I am probably most excited about the freedom and creative support that is being given to me at Nel Centro. I also appreciate working for an owner that is a chef himself. I consider this a refreshing change since it is becoming more unusual these days in larger restaurants. The Nel Centro Fall 2014 Newsletter is here! Dine With Us, Then Waltz To Your Show. The Fall Arts Season Is In Full Swing. Dinner & a show couldn’t be easier, really. October signals the start of downtown Portland’s vibrant performing arts season and Nel Centro is conveniently located just minutes away from Portland’s premier venues such as the Keller, the Newmark, Lincoln Hall, Arlene Schnitzer Concert Hall and the Portland Art Museum. Nel Centro has a proud tradition of supporting and partnering with such esteemed arts organizations as White Bird, Chamber Music NW, The Portland Opera, Third Angle New Music, Oregon Ballet Theater, PDX Jazz, Friends of Chamber Music and Northwest Dance Project. Nel Centro is the perfect location to rendezvous for drinks, appetizers and dinner before or after a show. Reservations can be made at nelcentro.com or by calling 503-484-1099. 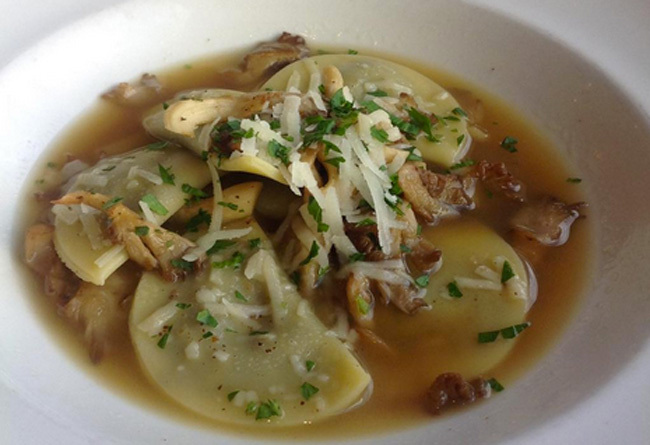 The new fall menu has just been unveiled and it showcases a number of comforting and delicious fall pasta choices including Spinach Gnudi with Radicchio and Gorgonzola Sauce, Mushroom Agnolotti with Brown Butter Parmesan Brodo and Roasted Butternut Squash Risotto with Toasted Hazelnuts and Sage. New fall entrees include a Braised Pork Osso Buco with Risotto Milanese and Citrus Gremolata, Spit Roasted Pork Loin with Seared Risotto Cake and Celery Root Apple Salad, and a Grilled Ribeye Steak with Kale, Olive Oil Mashed Potatoes and Porcini Butter. On the lighter side we have a new Cream of Cauliflower Soup with Fresh Chives and Olio Verde as well as a new Grilled Radicchio, Bacon and Goat Cheese Pizza. Reservations can be made today through Open Table. Two new seasonal craft beer handles have been selected by gentleman barkeep Nathaniel Stout to spearhead our fall beer offerings. The first is a Hopworks Urban Brewery Survival Stout. This beer is a creamy, organic, multigrain coffee-forward stout. That was a mouthful. Try a pint with our grilled leg of lamb dish and see if it is true that charred lamb and stout are a perfect match. Our second new offering is from Redmond Oregon’s Wild Ride Brewery and it is named “Mount Up” Maple Brown. This is a delicious Brown Ale with rich dark undercurrents of chocolate and maple flavors. Be adventurous and pair it with our Tiramisu Bombe and let the cards fall where they may. Bar manager Nat and his talented crew of young mixologists: Peter, Bryce and Molly have authored a new cocktail list that shifts away from the lighter easy-drinking summer spirits to darker more mysterious and complex ones. Two of my favorites from the recent tasting session are the Vieux Carre made with Old Overholt, Courvoisier Brandy and Carpano Antica and Autumn Leaves made with Makers Mark Bourbon, Averna, Apple Cider and Fresh Lemon Juice. 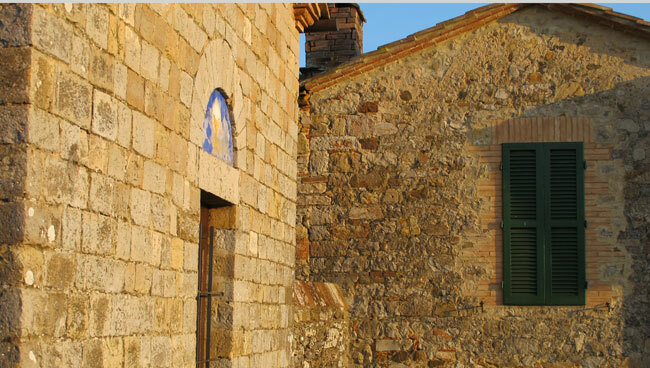 Join us for a very special evening with Diana Lenzi, Tuscan Chef & Winemaker from Fattoria di Petroio Winery on Tuesday November 4th at 6:30pm . The cost is $95 per person inclusive of reception, dinner, wine & gratuity. You may have heard the rumors about a new Eastside hotel/restaurant project near the Convention Center. The time has finally come to announce the two new restaurants that we will be launching in May of 2015 at the new Hotel Eastlund. The first establishment will be a ground-floor bakery/cafe and wine bar named Citizen Baker and the second will be a top-floor, beer-centric, casual American concept called Altabira City Tavern. The upstairs restaurant will feature stunning views of downtown Portland from the dining room and bar as well as an incredible outdoor patio. The design work has been a collaboration with the wildly talented gang at Holst Architecture. We could not be happier about this project so far. Stay tuned for more information. On September 5th, the A&E section of the Oregonian selected Nel Centro as one of Downtown Portland’s Top 10 Happy Hours. Thanks for the shout out and recognition (as if we didn’t already know). But wait, there is more to the story. Just four days later, The Big O announced the results of its reader’s poll and Nel Centro was voted by the people as Downtown Portland’s Best Happy Hour. Now that is more like it. Thank you, Portland. Still need to book a holiday party for your company, family or friends? Nel Centro still has several dates and private rooms available for this Holiday Season. We can provide an intimate dinner for 12 or a stand up reception for 150 and just about anything in between. For more information on availability please contact our Private Dining Sales Manager, Brianne Rudolph at [email protected] or by telephone at 503-484-1096. Download the Nel Centro Fall 2014 Newsletter as a pdf. Last week we named downtown Portland’s 10 best happy hours, the second chapter of Bar Tab, our first-annual bar guide, before turning over the question to you. With votes spread out across the board, and plenty of write-ins, Nel Centro, Southwest Portland’s Italian-French restaurant attached to the Hotel Modera, won by just a vote, just beating out The Nines’ rooftop bar/restaurant, Departure. 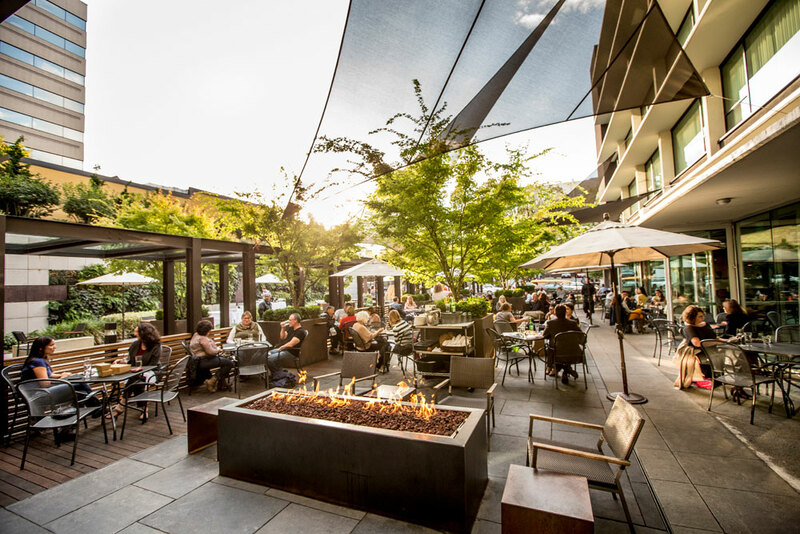 With arguably the best Westside hotel patio that’s not 15 stories up, David Machado’s flagship restaurant is the go-to happy hour for many office workers set free from the surrounding buildings. 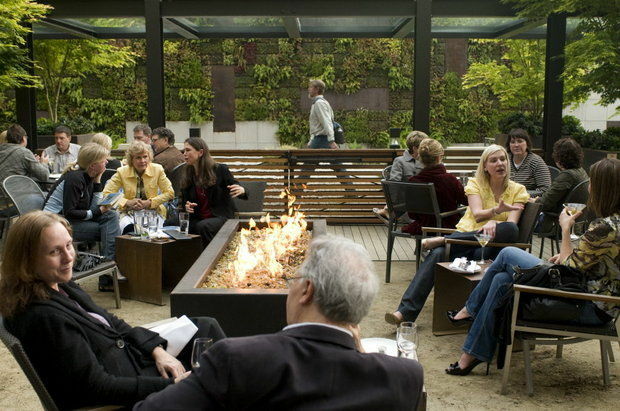 You can sit among green maple trees while gazing at the gas-fueled fireplaces, sipping $5 gin & tonics (well: Gordon’s). Read the complete review in The Oregonian.